A barn manager is responsible for ensuring the proper maintenance of the horses in their care as well as directly supervising the other employees that work in the barn. Barn managers must be highly skilled in all aspects of horsemanship, possessing a solid working knowledge of basic medical treatments, equine nutritional needs, and equine behavioral management techniques. Depending on the size of the stable, they may be involved with a variety of hands-on tasks such as feeding, mucking out stalls, turning horses out to paddocks, wrapping legs, and assisting with veterinary treatments. Barn managers are also often responsible for various aspects of running the business side of the stable. These duties may include supervising employees, employee schedules and payroll, ordering supplies and equipment, paying bills, arranging transportation to shows or races, scheduling lessons, and keeping detailed records. They also may be responsible for handling the scheduling of routine veterinary and farrier visits. Maintenance tasks, such as repairing broken fence boards or automatic watering machines, may be necessary for barn managers in smaller operations that do not have a separate maintenance department to coordinate such work. Skill with basic tools and repair equipment generally proves useful to those involved in the equine industry. Some barn managers utilize additional specialty skills such as assisting with foalings, acting as a stable’s riding instructor, or operating farm machinery (baling hay, mowing fields, etc.). A barn manager must also have excellent interpersonal skills, as they are responsible for interacting professionally with owners, students, employees, and equine personnel on a regular basis. Boarding stables must be particularly concerned with maintaining strong relationships with their clients and addressing any concerns they might have. A barn manager can work in many facets of the equine industry. Showing, racing, breeding, and boarding operations generally have a barn manager to oversee the care of the horses and management of employees. Possible areas of employment for a barn manager could include working in a hunter jumper, eventing, dressage, saddle seat, cross country, Western pleasure or reining, horse racing, foxhunting, therapeutic, or breeding stable environment. Some barn managers also specialize by working with a particular breed, such as Thoroughbreds, Quarter Horses, or Arabians. Barn managers can also advance to higher level equine management roles such as assistant farm manager, farm manager, or operations director. Some barn managers also go on to open their own facility after gaining experience working for major employers in their division of the industry. A college degree is not a requirement for securing a barn manager position, though it does lend strength to the applicant’s resume. Useful education would include a Bachelors of Science degree in a field such as Equine Science, Animal Science, or Equine Business Management. Computer skills are becoming increasingly important for equine industry managers, as many record-keeping systems are computer or internet based. Many bookkeeping and payroll management systems are also computer-based. The equine industry places significant emphasis on practical experience. Barn managers usually start their careers as interns or assistants before advancing to management positions. Aspiring barn managers should gain as much relevant experience for their resume as possible before seeking out a position. Barn managers must be extremely familiar with the type of competitive events that their barn’s horses are involved with, as well as the injuries that are likely to occur during these events. 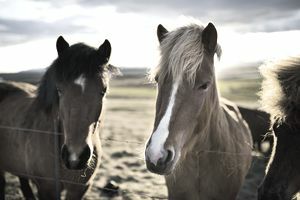 They must also be very familiar with the breeds of horses that are a part of their barn, as each breed comes with its own specific quirks and history. The salary for barn managers can vary widely based on factors such as their level of experience in the field, the specific duties, which are required as a part of the position, geographic location, and the area of the industry a manager works in (racing, breeding, showing, etc.). The salary range for a barn manager is $32,000 to $50,000, with the average salary coming in at $42,000 per year according to salaryexpert.com. While salaries are not particularly high for many barn manager positions, they often come with associated perks like an apartment or house on the farm, use of a farm truck, board for a personal horse, free riding lessons, paid vacation, and health insurance. The equine industry continues to grow at a slow but steady rate, and positions for barn managers should show continued growth over the next decade. Barn managers should readily find work in the popular showing and racing divisions of the equine industry.